The answer to the question of “now what?” is action. But, sometimes we sit in front of a mass of papers, a stuffed inbox, and a pile of dirty clothes and wonder: Now what? I would argue, start the washer first! If you work a job, raise kids, help out in the community, rake your leaves, mow your lawn, strive to eat like an adult and still try to train…well, you are elite! Very few people do the simplest of training regimes, like taking a walk, so by simple math, you are elite. Studying elite performance and the lessons learned from both success and failure can impact every area of your life. True, some people win lotteries, but most people who are successful in the area of finance used basic tools and principles, over time, to get them there. I always find insight in this quote from Bob Hope, the late, great comedian and movie star: I’ve always been in the right place and time. Of course, I steered myself there. In the second half of this book, we will look at a simple formula for raising performance, the APE method. Every step, clue and idea in this formula can be shared, used and adapted to everyone and every goal. And, ideally, you will know what to do. 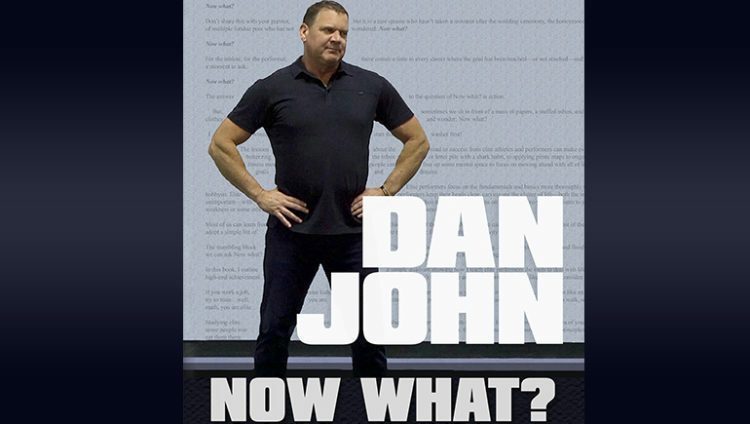 Click here to continue reading Dan’s new book, Now What?